I was drawn to the turquoise and rusty orange of corroded metal and old brick as we walked through the vacant buildings at 3118-38 N Rockwell. It was August 2017, and Elyse had invited me to the raw space that would later become Guild Row. Immersed in the early stages of brand discovery, I was looking for some inspiration for the visual language of the club. Each raw space that we stepped into, energetically chatting about future workshops, outdoor gatherings and details in the architecture, gave me ideas for concept after concept to explore. Back at my desk after conducting interviews with each of the founders, I spent hours researching the marketplace for social clubs, looking into Avondale as a neighborhood, and taking in what I had learned about the buildings. With my research concluded, I was ready to turn to pencil and paper. I need to feel ideas hitting the page through my fingertips. Ultimately, I landed on seven concepts, and settled on five to present to the team. The brand process to me is pretty straightforward: Give people visuals to absorb, display multiple potential solutions within each concept, and prepare to explain why you made the decisions you made. Then you iterate, collaborate, and refine until all parties feel good about where you landed. After reviewing the first round with the team, it was clear that two concepts stood out to the group. Those were Concept 1, inspired by the buildings themselves, and Concept 3, which focused on the physical tools that hands use for making things. We decided to combine the two. Though there are many wonderful quirks about 3118 N Rockwell, the slope of Rockwell Street that cuts across the row of buildings quickly became one of my favorite graphic nods to the location and foundation. This, I would learn, also inspired the plans for the new buildings that the team had developed. As a team, we worked through many weeks of revisions, paying close attention to the details of each tool illustration and its significance. 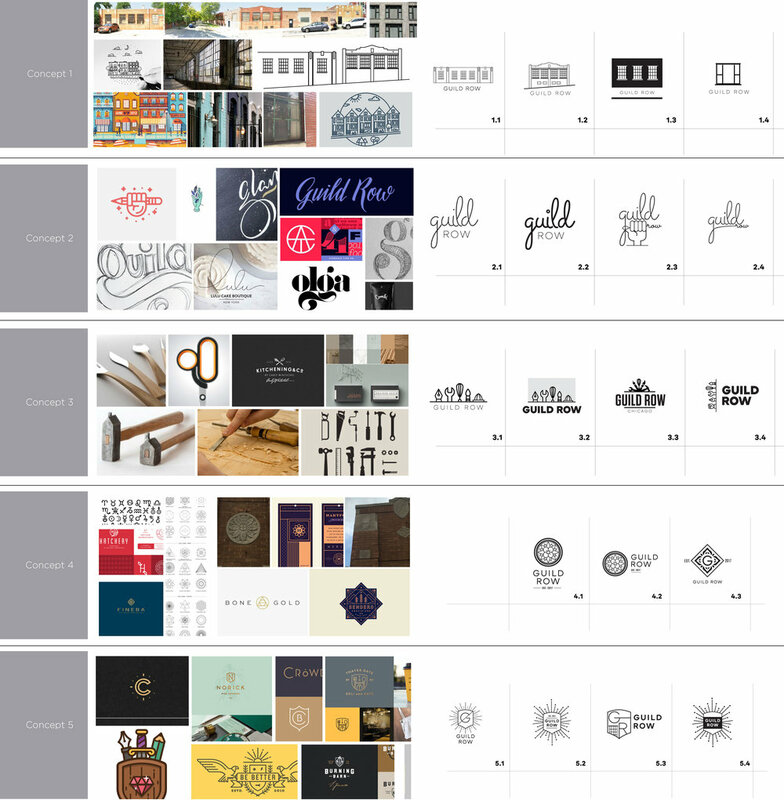 We reviewed a variety of colors, multiple fonts, and opportunities for extending the brand. We landed on a suite of logos inspired by the Rockwell street slant, the tools Guild Row members will use, and a reference to the streamlined design of the 1930s. Just like the space at 3118-38 N Rockwell has, this brand and accompanying identity system will evolve over time, and grow with the community it serves. I can't wait to see how we'll extend the brand to fit into interiors, marketing materials, merchandise and beyond. Making stuff for an institution that's all about making stuff: What could be better than that?